But my efforts to take a picture that does this corner justice have all proved futile. Maybe these plants just don't want to look too pretty. Maybe they all know that they were placed here for their toughness so they're afraid to ruin their image. Whatever the reason, it frustrates me. In the best of these insufficient pictures, you get a mere hint of the rich ruby embers provided by the 'Purple Knockout' salvia lyrata, a taste of the hearty amber glow of the carex buchanii, and a suggestion of the smooth silvery backdrop of sea kale leaves. What I really want to know is this: Is my camera failing me... or do my eyes see this bed through "gardener's glasses"--similar to rose-colored glasses, but showing the whole garden in a full, lush state of what it was intended to be? After a second year in which I did not get nearly as many blueberries as I knew were produced in my garden, I decided that certain measures needed to be taken. 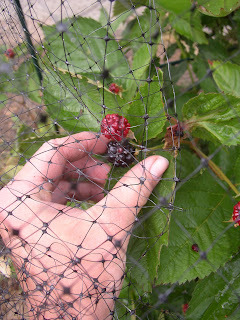 As my blackberries began to mature, I put up some fruit netting to foil birds, chipmunks, neighbor kids, and all other manner of fruit-stealing varmints. The netting is easy for me to get up and under, but it's going to be heck to remove from the shrub later--I was in too much of a hurry to build a proper frame for it, which would have made removal much easier. A less combative coexisting-with-animals story can be found in my front garden. When we're in the front yard I hook Coco up to one of the infamous lions with her 6ft. leash. She checks out the new smells and then usually lays down in a spot that allows her to survey the street while I putter. If someone has the audacity to walk down our side of the street, or if Another Dog appears within sight of the house at all, Coco must immediately jump up and investigate. Her front paws generally land within a 3ft by 18in semicircle as she barks a few times, then strains to get her nose close enough to the interloper to get a good sniff. As you can imagine, this semicircle is a tough place for any plant to live. Coco has been trained pretty well in terms of staying out of the rest of the garden--except when she steals tomatoes and beans to eat--but frankly I don't mind her letting people know she's here with one or two barks. I don't want to hook her up to anything else, either. If I put her up on the porch, she'd be out of range of the occasional ear scratch or tummy rub as I walk past... where's the fun in that?! So I took a flat rock from the backyard and placed it in the part of the semicircle where she tends to land most often. Then I dug out several chunks from the golden oregano that I've been using as groundcover in other parts of this bed, and used it to fill in the rest of the area. Golden oregano seems to spread in a rather mannerly way for me in this western exposure, and its bright acid yellow spring color gives way to a nice fresh chartreuse in the summer. The golden oregano is working out wonderfully there, as it has now spread to fill in its little area and easily handles the occasionally trampling by my 90lb. dog. As a bonus, when she does crush a few leaves underfoot the lemony smell of golden oregano perfumes the air. And if a parade of dogs should happen to march down our street, and cause her to completely ruin the clump? Well, I have more to dig up and replace it--but if I didn't, then it would cost me all of $2 at my local garden center to buy another pot of golden oregano next spring. 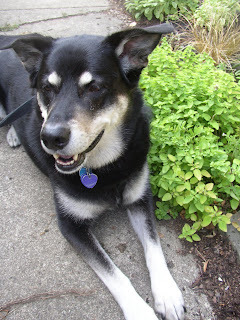 And I get to have my gardening assistant at my side while I mess about in the front yard. In my mind, you can't beat that deal any way you look at it. Generally, when I think of "corporate" or "public" landscaping I think rows of Japanese barberry and burning bushes, with tons of daylilies--mostly Stella D'Oro--stuffed in for summer color. 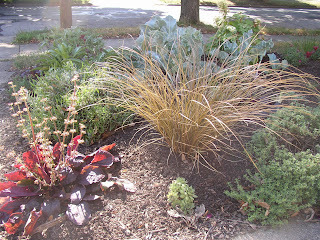 Recently, some places have gone a bit trendier and started to mix in ornamental grasses as well. But a few places I haunt in the Cleveland area have really put some thought and imagination into their landscaping, and I admit to being inspired. 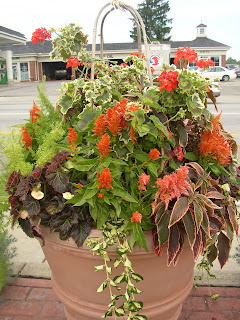 The city of Brecksville, which is near where I work, does interesting containers like this one. Orange celosia, Non-Stop begonias, variegated geraniums, and orange-edged acalypha stuff this container full of warm color. Its two smaller companion pots feature a bronze cordyline, more of the celosia, and silver trailing lotus vine. I like how the fine textures of the lotus vine and the asparagus fern used as filler in the larger center pot echo each other nicely. It's not just containers that the Brecksville public works department does well, either. 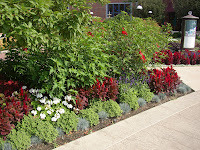 In their town square they have annual beds featuring dark-leaf cannas paired with ornamental grasses, bronze- and purple-leaf dahlias, and even "lowly" marigolds and salvias. Similar combinations grace the ends of long berm beds that split several 4 lane roads through town. In between the annual beds these berms still show 3+ seasons of color thanks to a low-maintenance mix of euphorbias, Russian sage, spring bulbs and various grasses. Another place that does annual color well is Crocker Park, and upscale "shopping community" in Westlake. 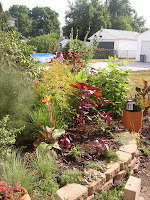 Some of their great containers include large bronze-glazed ceramics planted with just one type of orange- and yellow-flecked coleus, and huge pots with forest-worthy stands of dark-leaf cannas underplanted with enough cascading pineapple mint to keep me in tea for a decade. In the first picture you see the hibiscus tucked in amongst a red-flowering, red-leaf celosia and a red-and-yellow flowering lantana. The silvery carpet underneath it is 'Silver Falls' dichondra. In the second picture, you see another bed with hibiscus and red celosia, but this one includes white geraniums, dark purple angelonia, and the refreshing combination of 'Cerveza 'n Lime' plectranthus and blue fescue. 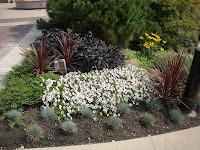 A nearby bed goes more for the cool end of the color wheel with blue fescues, bronze cordyline, white petunias, Mexican heather, some kind of dark purple alternanthera, yellow-variegated grass, and 'Black Pearl' ornamental pepper. The black-eyed susan appears to be a self-seeded accident at first glance, but it adds some much-needed height there and a great leaf contrast as well so I believe that it was an intentional addition. 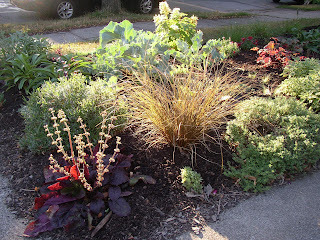 See the yellow coleus edging the separate bed further back in picture two? 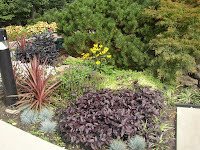 It compliments the yellows and purples in this front bed so nicely, and also leads your eye past the edge of the bed and over the sidewalk into the next area of color. That's another thing they do particularly well in this maze of beds around the fountain. I am learning a few tricks from both of these public landscaping examples. From Brecksville, I am learning how to work with annuals that have interesting leaves and artfully combine them. 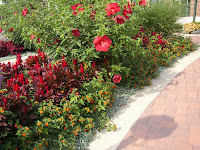 From Crocker Park, I am learning to better use annuals to fill in my regular planting beds. I don't really know why, but I tend to keep my annual color in containers instead of putting them directly in the ground... now I see what I've been missing! 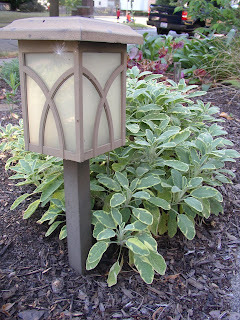 And from both, I'm getting ideas on how better to echo the colors and textures of key plants to make for a cohesive look in the garden. Hopefully learning these lessons will help keep my garden from being too "bitty"... but I'll have more thoughts to share on that score tomorrow. Well, there seem to be more blooms in July than I managed to scrounge up in June, but I've come to the realization that it's still all about the foliage and texture in my garden, anyway. Now I need to embrace that instead of just living with it... maybe I'll get there by the August version of Garden Bloggers' Bloom Day? ...but I completely underestimated the synergy that the two would have if they were in flower at the same time. Wow. This picture was taken on an overcast day, when these two plants really pick up on the blue tones in each other. I will have to take another picture to show you on a sunny day, when weird things happen--the burgundy reads red and the blues turn a warm silver in this bed when the sun shines on it! 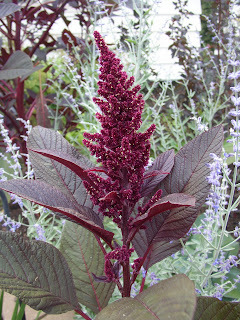 I read avidly about garden "fashion," too.... new and (sometimes) improved plant cultivars! 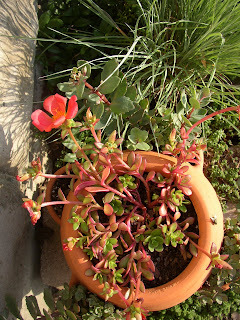 This season I've managed to resist a lot of "hot" plants but have picked up a "designer" portulaca called 'Yubi Red,' fell hard for the orange-y leaf heuchera trend, snagged two 'Midnight Reiter' geraniums on clearance, and used a 'Red Sensation' cordyline as my (container) accesory of the year. 2. Although my hair has darkened and turned me into a brunette, I was a tanned towhead of a kid and worked the blonde/blue eyed California Girl look all through high school. Yes, I even went tanning before my junior prom... and I shudder every time I think about it. Older and wiser, I now wear a floppy straw hat and long pants/sleeves while gardening. I also religiously slather on my favorite sunscreen: Neutrogena Ultra Sheer Dry Touch. It comes in SPF 55 and SPF 70! As my slightly acerbic--and wholly amusing--friend Alli says doubtfully, with a resigned shake of the head, "Well, you look like a ghost now but I suppose you'll have fabulous skin when you're 60!" 3. I have a special affinity for the water. I spent countless hours during my childhood summers swimming in my grandparents' pool and waterskiing at my family's cottage at the river. When I found out that my maternal grandfather's family came from a Welsh seaport, that felt incredibly appropriate to me. I have had multiple dreams where I have died by drowning, and yet they have never been sad or scary--they felt more like "going home." I have been skinny dipping several times (always in a natural kind of setting, never really in an overtly sexual one.) And I love nothing more than to body surf in the waves of the Atlantic Ocean. My affinity for water is one reason why I enjoy incorporating so many water-related and seaside garden plants in my dryland garden. 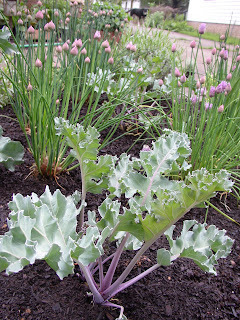 I've posted pictures of my sea kale, crambe maritima, many times. Most recently, I added some catchfly, silene maritima, as a groundcover. 4. I used to paint and draw, and wanted to go to art school until my senior year of high school. Why I stopped producing my own pieces and destroyed most of my old work is a sordid tale of teen angst and young love (translation: it makes me look like an imbecile so I'm not telling it!) but I still have a deep love of art and devour books, museum exhibitions, art shows, and the like. I have a sneaking suspicion that even if you deliberately abandon the regular tools of the artistic trades, art does not take its leave of you so easily. I sometimes wonder if my garden has become my canvas... but then I also wonder if I have delusions of (artistic) grandeur. 5. At one time, maybe 7 years ago, I weighed almost 80 pounds more than I do right now. I still cringe when I hear people make judgemental comments about obese people such as, "How could that person let himself get like that?" Getting "like that" certainly wasn't a conscious decision for me. I had always been athletic and mostly fit, so discovering I was overweight really surprised me. People are generally disappointed when I tell them how I lost the weight--no magic pill, liquid formula, or denying myself a taste of cheesecake if I was jonesing for it. The weight came off over the course of a year in which I concentrated on walking every day and made fruits, vegetables and whole grain foods a priority. This is when I actually started to garden. I couldn't believe the price of "fresh" herbs in the grocery store--or how wilted they looked--and I knew how much better tomatoes tasted sun-warm and right off of the vine. 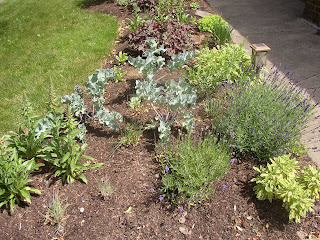 In the beginning, there was "just" a veggie garden, but then an ornamental bed was created to add some color to the shady front bed of my north-facing house. At some point, I had an epiphany. Maybe mixing the edibles and the ornamentals would give me the best of both worlds: A beautiful garden that nourished both my senses and my stomach. Yesterday, I spent the whole day in my garden. Sometimes I forget how restorative it is to just immerse yourself in the yard. 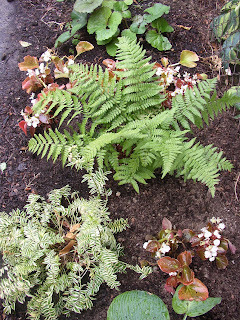 How many problems you can solve--or at least make peace with-- while you are weeding and mulching and moving plants. The parts of your brain that hum along while you work with your hands in such a way must fuel the thinking parts of your brain in a magically synergistic way. Speaking of humming, I was very happy to see so many bees busily working away at the flowers in my yard. 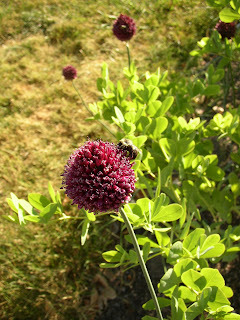 They seemed particularly fond of the drumstick alliums and the 'Caradonna' salvia. The lawn visible below those allium flowers and baptisia foliage is approaching a prairie/wheat hue... beautiful, but very inappropriate for a fescue mix. I don't know the statistics off the top of my head, but I don't need numbers to tell me that we are very dry. The pictures say it all. I refuse to water my lawn, though. 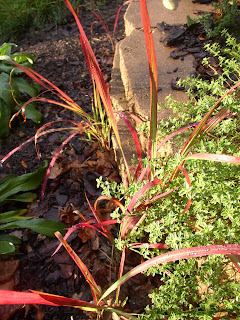 Watering is reserved for the newly planted--and things that show obvious signs of distress, like the cardinalflowers and cimicifuga that I found lying horizontal yesterday. In addition to some emergency watering, I did get a few other projects accomplished. 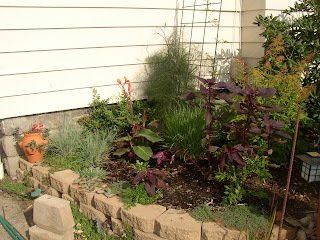 I built a small retaining wall and mulched the bed where the baptisia reside. I harvested the rest of my garlic and hung it in bunches downstairs to cure. 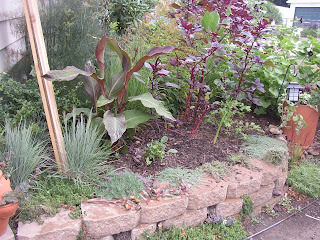 That left me with several holes in "the canna bed," as you see in the second picture... to fill them I planted everything from clearance dahlia roots and gladiolus corms to pepper plants and beet seeds. "Do I contradict myself? Very well, then, I contradict myself. (I contain multitudes.)" Today was my longest day at work this week, an 8am-10pm marathon. But if I just get through the next three days, round two of our big weekend events at work will be finished. The nicest part about the finishing is that three comp days will be waiting for me on the other side of this weekend, and then I can go out and drink in the joy of gardening... really and truly gardening, not just throwing my attention to one or two little necessary tasks here and there in an evening... once again. In comments left on an earlier post of mine, MrBrownThumb mentioned that he was sad that his hollyhocks--he has a double black variety!--were already done blooming. That reminded me that I meant to make another post about a little experiment of mine. Most of these are going to be ripped out next week to make way for a raspberry bush and a few other items that I need to get planted. 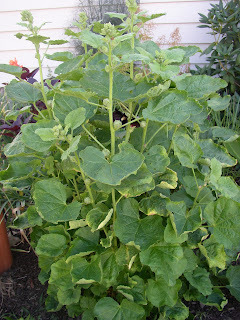 But that doesn't mean that I'll be without hollyhock blooms. In fact, some of my hollyhocks are just now beginning to bloom! This spring, I read that you can effectively deadhead hollyhocks by cutting back the entire flower stalk after they bloom, which may encourage rebloom on shorter flower stalks. At the same time I came across this tidbit, I was also reading the new version of The Well Tended Perennial Garden by Tracy Di Sabato-Aust and getting some ideas on "managing" the bloom time of various plants. Having planted more hollyhocks than I had planned (because the seed surprised me with great germination) I found myself with plenty of subjects for experimentation. And so I went out into the backyard and cut back the flowering stalks on two of my hollyhocks before they even got a chance to grow many buds. The cutback plants looked terrible for about a week (I wish I had taken a picture) but then they put forth a flush of new leaves. Their foliage has held up much better than that of the taller untouched plants--most of the latter had gotten so ugly on the lower 2 ft of the plant that I de-leafed them and left the plants with bare legs instead. As you can see in the second picture, the cutback plants have just a few messy leaves but otherwise have good full foliage. They are just now beginning to bloom. At this point, I'm not too sure what I think about the results my experiment overall. I love that the foliage on the cutback plants stayed nicer after that initial shock period, and that they are very full. 3-4 feet is a more manageable border plant to be sure, so the height is nice for the location where the cutback plants reside. 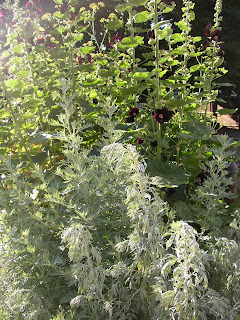 On the flip side, I'm no drama queen, but... okay, I have to admit that I planted black hollyhocks partly for the excitement factor, and cutting these plants in half greatly reduces that for sure. I find myself looking at them and saying, "Oh, that's nice," instead of the "Wow, check these out!" that their taller brothers and sisters inspired.